Smartphones today are no longer simple communications devices that surf the web and offer a few apps. With the introduction of Artificial Intelligence (AI), today’s smartphones should be perceived as ‘platforms of intelligence’. Today’s phones strive to understand user behavior in ways that will elevate the user experience to greater heights. Gartner has predicted that by 2022, 80% of smartphones will have on-device AI capabilities, this is up from 10% in 2017. In coming years, an AI smartphone will no longer be a ‘nice to have’, it will be critical to fulfilling consumers’ needs. With Google Assistant, users can now utilize voice commands to complete actions with more convenience and more precision. With this feature, completing tasks, such as playing music or videos, sending messages, booking hotel scan easily be done anywhere. The best part? These can all be done hands-free. Jovi also comes with Jovi Smart Scene and GoogleLens that can easily decode context and situations accordingly. These two features are designed to help users to save valuable time while automating simple chores. The V11 is also here to accommodate the busiest workaholics. 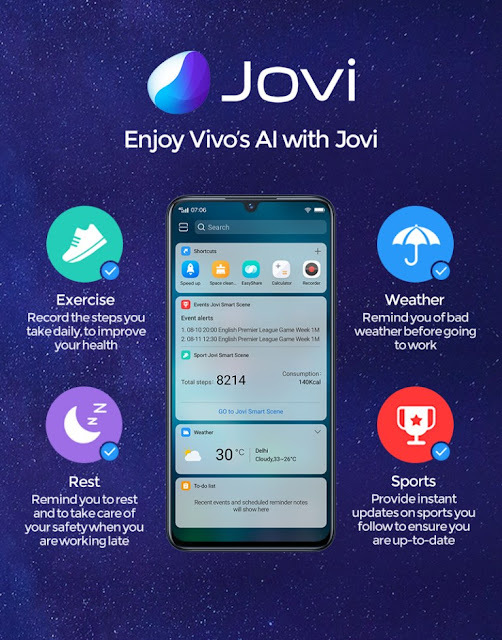 V11’s Jovi AI Engine delivers a more efficient allocation of CPU and memory resources than ever before. By ‘reading’ user phone usage habits, the CPU will provide a custom operating mode to consumers. For the high-performing professional, when the V11 detects that he/she is constantly working overtime based on their location and timing, it will remind them to take a rest early. The heart of the V11’s AI features is the powerful Qualcomm Snapdragon 660 AIE processor, which features first-class energy efficiency and processing power that seamlessly accommodates the busiest schedules. Beyond the powerful Qualcomm Snapdragon 660 AIE processor, the V11 comes with a 6GB RAM + 128GB ROM setup which ensures storage is enough for all users. Not only that, Vivo’sDual-Engine Fast Charging also safely tops up the large 3400 mAh capacity battery at a rapid speed, ensuring that the phone battery is well-charged, so gamers can focus on winning.The V11 is designed to provide a more personalized experience, and to streamline heavy workloads with ease. AI will be the catalyst to stimulate the growth of modern smartphone software and hardware. Essentially, it will be the core engine for understanding and interacting with users in a more intelligent and engaging way.